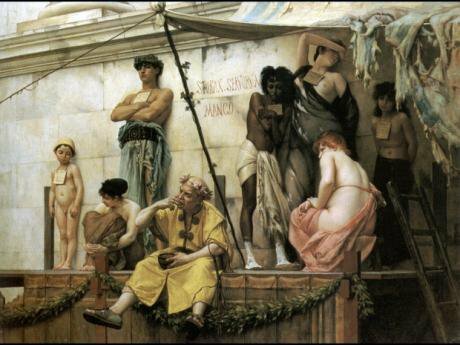 The Slave Market by Gustave BoulangerIn the twenty years I have been working in this field, human trafficking (now popularly referred to as ‘slavery’ or ‘modern-day slavery’) has moved from the margins to the mainstream of international political attention. New laws have been adopted; new institutions have been established and hundreds of millions of dollars have been spent to support prosecutions, victim protection and prevention. While concern about exploitation has provided some impetus for action, other inducements have helped enormously. Chief among these is the annual US State Department “Trafficking in persons” (TIP) report, which assesses and grades each country’s response. Failure to meet stipulated standards renders the country concerned liable to a range of economic sanctions. The impact of these reports is difficult to calculate but impossible to ignore. No country likes to be publicly identified as a failure and many have proved willing to take significant steps to avoid or repair a negative assessment. Striking changes have also taken place in the civil society response. Until very recently, ‘trafficking’ survived, just barely, as a niche issue within women’s and human rights groups. Today it is the focus of a major social movement that, according to the publicity of its self-proclaimed leaders, is uniting millions of individuals against the scourge of ‘modern slavery’. A major game-changer has been the emergence of the philanthropist- founded NGO, of which Walk Free, established by Australian mining billionaire Andrew Forrest in late 2012, is the most prominent example. At the time of its creation, Walk Free’s explicit mandate was to ‘eliminate slavery in [Forrest’s] lifetime. As the Economist reports, Forrest consulted with Bill Gates, the original founder-funder, who advised that he needed to find a way to quantify the problem because (in a phrase that speaks volumes about how development and human progress is currently understood and managed), “if you can’t measure it, it doesn’t exist”. This led directly to the Global Slavery Index, which ranks most countries in the world on the basis of the prevalence of ‘slavery’. The first Index was released in 2013 and the second (which, in addition to prevalence also measures vulnerability to slavery and government responses) in November 2014. The Global Slavery Index did not emerge in a vacuum. Contemporary governance has come to rely heavily on rankings and indicators. Particularly in complex areas such as human development, corruption and the rule of law, these Indexes provide (or are treated as providing) the otherwise elusive ‘evidence base’ that helps to secure support for particular responses and rationalize decision making. One of the great frustrations of the anti-trafficking / anti-slavery movement has been the absence of hard data. We know – instinctively and anecdotally - that millions of people in all parts of the world are trapped in situations of exploitation from which they cannot escape. But human exploitation takes on many different forms, occurs largely among hidden populations and is notoriously difficult to find, let alone quantify in any meaningful way. That is a problem for those working to address such exploitation because, as Bill Gates pointed out, things that can’t be measured don’t really exist. If they don’t exist then pushing for change becomes difficult, if not impossible. This creates an almost irresistible temptation to make a silk purse out of a very tattered sow’s ear: to harness the power of statistics and numbers in order to create an illusion of concreteness that masks the slipperiness of what we are counting and how. It is understandable that Walk Free, a new player, seeking to make its mark in a highly competitive environment, has succumbed to that temptation. Less forgivable are the weaknesses that mar the substance of the Index and compromise its findings: a mysterious, inconsistently applied methodology, a raft of unverified / unverifiable assumptions and multiple, critical errors of fact and logic. Even the basic unit of measurement “modern slavery” is flawed: the definition is self-created and, bizarrely, changes from one year to the next. The methodology used in the first Index to establish prevalence of slavery was extremely crude: based on four studies, dealing with seven countries, that was then extrapolated across to countries considered to be in a similar situation. In other words, on the basis of an interpretation of data sources relating to the UK, the US and Eastern European countries, the Index blithely declared the number of slaves in Germany at the time of writing to be 10,646. The 2014 Index sought to improve on this by conducting its own random sample surveys in seven countries (then applied to three more) and utilizing existing survey data from a further nine. The instability of the resulting data is reflected in lower and upper estimates. The lower estimate of slave numbers in Brazil (one of the formally surveyed countries) is 45,006. The upper estimate is almost one million and the final, unexplained figure is 155,300. Questions can also be asked about the quality of existing survey data used. For example, the Index borrows heavily from material previously published by two of its authors in a human rights journal. But even here, application is indecisive and inconsistent: the 2014 Index rejects that material in relation to three countries (the United Kingdom, Italy and Poland) after the figures it first produced in 2013 were rightly challenged. Even the very well informed reader will struggle to understand how the fragile sample data from 19 countries was so confidently extrapolated across to the remaining 148. The division of surveyed countries into six ‘clusters’ for extrapolation purposes looks impressive at first but one starts to worry when this results in Egypt being classified as “high income” and Hong Kong falling behind China on the same measure. At some points application of the extrapolation “protocol” verges on the ludicrous. For example, Thailand and Brunei are claimed to have the same proportion of their populations enslaved – a risible assertion to anyone with even cursory knowledge of the situation in those two countries. In calculating the number of slaves in Singapore, the Index identifies that country as being half like Japan (whose figure is calculated on the basis of it being just like South Korea, whose figure is calculated on the basis of it being somewhere in between Cyprus and Western Europe) and half like Sweden. Incredibly, the number of slaves in South Africa is calculated on the basis that this country is 70% like Western Europe (because: “[h]istorically, South Africa has been culturally similar to western, democratic nations”) and 30% like Africa. After noting that almost no reliable information exists on slavery in China, the Index’s authors cheerfully proceed to declare that they are comfortable with China being considered pretty much the same as other East Asian nations like South Korea, Taiwan and Japan. Despite these and many other egregious flaws, including those related to how both vulnerability and government response are assessed, critical examination of the Slavery Index has been oddly muted, especially when compared to the strong attacks (many of them amply justified) that have been launched against the US’s ‘name and shame’ TIP report. The most benign explanation is that those most affected – governments – simply don’t care. We might also wonder whether the avalanche of statistical and quantitative research jargon is deliberately intended to have an intimidating and silencing effect. Other possible explanations for the lack of critical engagement with the Index are even more worrying because they concern the rather grubby realities of power and funding. The leadership of Walk Free appears to have virtually unfettered access to the global elite; securing glowing endorsements of the Index from a stable of international figures - from Clinton to Blair, from Bono to Branson. For the mainstream media and pretty much everyone else, this was more than good enough. With only marginal exceptions, coverage of the Index has been uniformly fawning and superficial. One may have expected prominent and respected members of the anti-trafficking / anti-slavery community to be falling over themselves to critically engage with the Index. The resounding silence from this quarter is disquieting and deserves scrutiny. Walk Free, along with its various subsidiaries, has come to the big table with a seductive promise of abundant funding at a time when previously generous government donors are flagging. A number of international organizations and individual experts who would seem to be in a strong position to critically evaluate the Index have been effectively co-opted through partnerships and advisory roles. For example, the International Labour Organization has spent decades trying to refine its global estimates of forced labour and certainly possesses the expertise and authority to thoroughly discredit the methodology used in the Index. But the ILO is a partner in Walk Free’s recently launched Global Fund to End Slavery. In fact the public 'launch' of the Fund was held at ILO Headquarters in Geneva with the participation of senior ILO officials. Cash-strapped, like all UN agencies, and with an understandable desire to maintain its place as a key player on this issue, the ILO is hardly in a position to bite the hand that feeds so generously. Why does all of this matter? The most immediate problem is one that has faced the US TIP Report: poor information, presented as fact, contributes to poor decision-making and sometimes even highly damaging, unintended outcomes. It is ironic that this was the asserted rationale for producing the Index in the first place. But we don’t make things better by pretending to know much more than we do. Only the shortsighted would oppose an injection of energy, commitment and resources into the battle against ‘slavery’. If Walk Free proves capable of producing reliable and replicable data through the consistent application of high quality methodology, then this will be a valuable contribution to improving our understanding of how exploitation happens and why. But that is not happening yet. And, even while it collectively obsesses over numbers and data points, the anti-slavery community as a whole would do well to consider just how far it is really willing to go in attacking the structures that preserve and nourish a world built solidly on the foundations of human exploitation.